Why do electric toothbrushes comes with 2 pin chargers? So you have just bought that new electric toothbrush, but wait, how do you charge it? It has a 2 pin connector on it, rather than 3 pin connector you are used to here in the UK. Well, there is a sensible reason behind this, which I will explain in a bit more detail below. However, for those of you who want the quick answer or solution, you will be pleased to know that there is one. They are 2 to 3 pin adapters available from many large retailers. Ok, so there is good reason behind the 2 pin adapter, I will now explain this and I promise I won’t get too technical. The reason is all to do with SAFETY. Please note: This information relates to the UK and Europe primarily, America and many other countries differ. In the UK the mains electricity that you connect your appliances and gadgets into works on 240 volts. This is a high voltage and can cause serious injury and death if you were to touch a live electrical line. Under most circumstances if you include water and electricity the effects of injury are much greater as water reduces the resistance the human body has to the electrical current. Therefore to protect people, a ‘safer’ less powerful form of electrical socket was introduced into bathrooms, where water is generally present more frequently. This safer solution was and is the 2 pin socket, similar to the 2 pin SCHUKO connector found in many European countries. This meant that more traditional power hungry products could now not easily be used within these rooms, only lower power items, therefore reducing the chances of injury. An extreme example, but imagine if you had a toaster in your bathroom. Whilst this was switched on, it fell into the bath, which was full of water and you were in it too. The resulting consequence is not one I like to think about it. You will be ‘toasted’ yourself. Toasters don’t come with a 2 pin connector, so you can’t use it in your bathroom and as a result you are now a bit safer from electrocution and possible death! Nobody wants to be toasted whilst in the bath, so to avoid people doing silly things like this, the ‘safer’ less powerful sockets were introduced. With it came a new connector. Hence the 2 pin plug you find on the charging stands for electric toothbrushes and to power other things like electric shavers, which are most commonly used in the bathroom. These sockets are often known as ‘shaver sockets’ because this is what is commonly connected into them. Many faceplates for sockets in bathrooms will say ‘shavers only’. UK building regulations mean you cannot fit a regular 3 pin mains power adapter in a bathroom, even the ‘shaver socket’ has to be a safe distance away from the bath or shower. This is often why many sockets are part of a light fitting above a mirror and hidden behind a little door, making it harder to access. All to protect you and I from injuring ourselves. Other countries around the world may have normal sockets in their bathrooms. Why? For some it is because of the lower voltage used, so the effects of electric shock and serious injury are reduced. In other cases it is less established safety measures and in others there is a trust that you as an individual won’t do anything silly enough to put your life at risk. You could today still if you wanted put a toaster in your bathroom but you would have to plug that toaster into a 3 pin socket in another room, probably via an extension cord. There is only so far legislation can go at this time to stop you from doing things like this, but going to such efforts puts you off doing it at all. For those who want a little more technical reasoning, inside the socket is what is known as an isolation transformer. This works by using the mains supply to power a small transformer that is electrically isolated from the rest of the supply and any earth in the bathroom. Theoretically you can touch the live output and the earthed metal work in the bathroom and be OK.
Want to know a little more? The following short video from Skross I believe gives a little more detail and further explains earthed and unearthed sockets and connectors. Does that now make sense? I hope so. However, I understand there are probably still a few questions you want answered so here are a few common questions and answers. I don’t have a 2 pin shaver socket in my bathroom, what do I do? You need to purchase an adapter, that will allow you to connect a 2 pin connector such as that on your electric toothbrush to a 3 pin socket. They are often really inexpensive at just a few £. A great example is the 2 to 3 pin adapter plug complete with fuse — View on Amazon. Once you have this, you can then charge your toothbrush from a socket anywhere else in your home. Can I connect a 2 pin connector to my 3 pin mains socket? Yes you can. You require a good quality, fuse adapter such as that from TC Travel (view on Amazon) and you are then set to power your 2 pin powered appliance from a 3 pin mains adapter. What’s the best 2 to 3 pin mains adapter? There isn’t one ‘best’ 2 pin to 3 pin mains adapter. There are many options but you generally get what you pay for. It is worth paying a bit more to ensure you get a good quality adapter as you don’t want to risk any electrical shocks or damaging your electronic items. A very cheap option is the Gadget Hut shaver adapter (view on Amazon). A slightly more expensive option, but possibly better quality option is the previously mentioned TEC Travel option. Is a 2 pin shaver plug the same as a 2 pin European mains adapter? No, not quite. A 2 pin plug found on an electric toothbrush or shaver has pins that are closer together than a traditional 2 pin EU mains adapter. 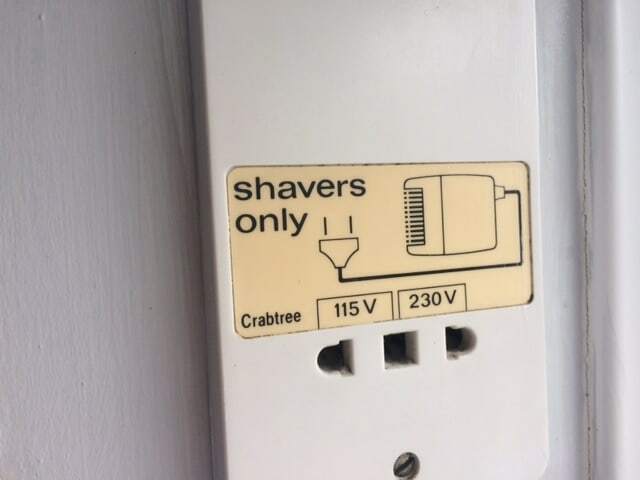 This means that appliances that would normally connect to a shaver socket cannot and should not be connected to mains power in Europe. For example, if you charge your electric toothbrush in a shaver socket at home in the UK, that same plug cannot and should not be connected to the 2 pin socket found on the wall of your hotel room in France or Spain. However, most bathrooms will have a shaver socket which you can connect to. Can I take my electric toothbrush travelling with me? What adapter do I need? Yes you can take your toothbrush with you when travelling. Much depends on where you are travelling too. We have a full guide to using an electric toothbrush abroad which you can read, but a summary is explained below. 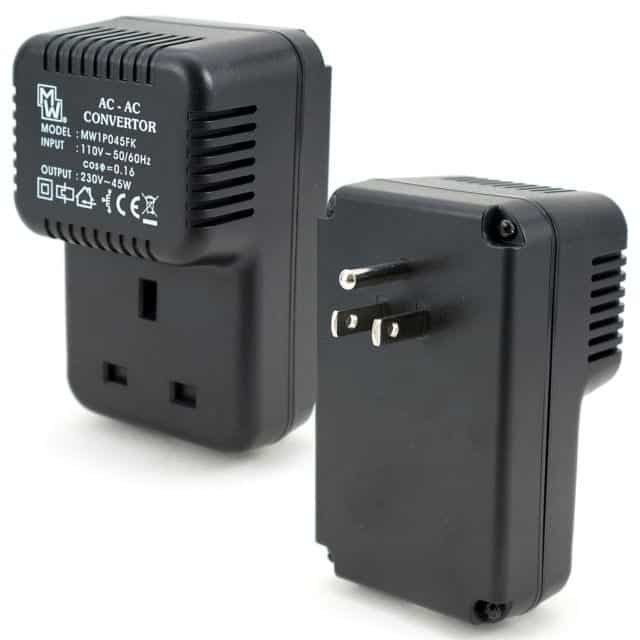 If you are travelling to another country that has the same electrical voltage then you simply need a plug adapter. 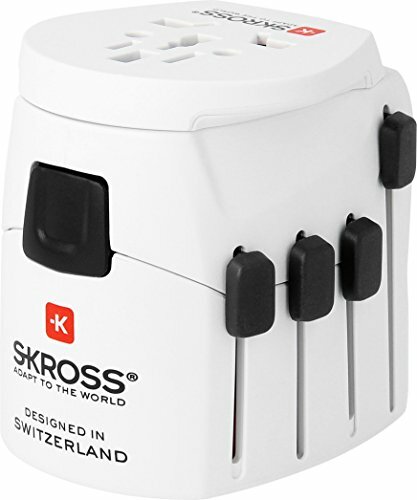 A great solution I believe is the Skross Pro World Travel Charger (view on Amazon). It works in over 220 countries and works with devices up to 2500w. You still need to have a 2 pin to 3 pin adapter fitted to it, but it works in so many countries. Most larger hotels will have a ‘shaver socket’ in the bathroom that will be suitable for your electric toothbrush. However in some counties and regions this may not apply. When travelling to a country that uses a different voltage to that in your home country, you need to check a few things. For example, let’s say you live in the UK and are going to the USA and assuming you are going long enough that you need to charge your brush when there. What you may need though is a plug adapter. This is to convert the 2 pin adapter found on most charging stands in the UK and Europe to work with the power supply in the other country. Using the travel form the UK to the USA again, the ‘Step Up’ voltage converter has the 2 pin US connector on it, but actually offers up a 3 pin UK power adapter. However your toothbrush has the 2 pin adapter, so although you are travelling to the USA, you will need the 2 pin to 3 pin adapter. Why are 2 to 3 pin adapters not included with my electric toothbrush or shaver? This is a good question and one we have often thought about ourselves, it would be a nice addition. There are 2 main reasons. The first is the need for it. Many, but not all bathrooms have a 2 pin shaver socket, so the adapter is surplus to requirements for many. The second is cost. If every electric toothbrush came with a 2 to 3 pin adapter it would put the cost up by a few £ and many companies want to keep costs down, so it is often best to exclude it. Can I get an adapter to charge multiple devices from a shaver socket? I want to charge a toothbrush and shaver from one socket. Generally speaking they do not exist from reputable sellers. I have seen some, but we have questions about their safety and reliability. The sockets are not designed to take ‘extra’ strain. 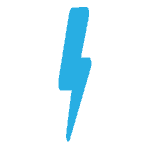 You are best powering or charging each device independently as and when you need it. For example, connect and charge your toothbrush, when that is done, connect and charge your shaver or other appliance. I really hope all of the above is helpful to you and has answered any questions you may have had about 2 pin plugs and adapters required for electric toothbrushes and similar products like shavers. If you have any questions, or have any of your own, tips, advice and feedback that can help improve this article or indeed help others, your input is most appreciated. Please comment below. Is it legal/illegal for a shaver to be sold in the UK with a UK 3-pin plug (not to be used in the bathroom)? I know most come with either an EU or UK 2-pin plug, but is it actually illegal for this not to be the case? I can’t find any info on the legality of this elsewhere, just that it’s not common. I am not a lawyer to be able to advise on whether it is legal or illegal. As far as I am aware it is not illegal to sell it with a 3 pin plug. I would be surprised if it was illegal. Although tradition/history states that most will charge and use their shaver and toothbrush in the bathroom you don’t have to. I have tested a couple of toothbrushes that have 3 pin plugs on the charging stand rather than 2 pin sockets. Many now come with USB chargers too, which are not suitable for the bathroom. Hi. I have happily used my ‘shaver’ socket to charge my electric toothbrush for years. I now also own a brand new WaterPik flosser which is operated whilst plugged in. It works in the socket but it doesn’t reach the sink because, as you say in your article, the sockets are usually a distance away from where the water is. But I need to use it over the sink. Is there such a thing as an extension lead? I realise this might need to be attached and sealed because of water, but I can’t believe I can only find adapters. I just need about another foot of cable so I can use the device like a dignified human at my bathroom sink, instead of hunched over, holding the tank part of the device in one hand and the flosser in the other. You are not the first to express the need for a longer cable. Sadly, there are no such extension cables that I know of. Paula, generally UK Shaver socket CAN be reasonably close to the area of a wash basin, and I suspect that leads on appliances designed to be used with them have short leads to prevent , say, someone plugging in something and using it several metres away, eg while in the bath. Bathrooms are deivided into designated zones, 0, 1, 2 and regulations cover what type of light, heater other appliances can or cannot be installed in the different zones. Shaver sockets are allowed almost anywhere outside the most high-risk zones – which are generally over the bath or close to the bath or shower. I have seen shaver sockets built into a light that is designed to be sited over a bathroom mirror immediately above a wash basin. In my own en-suite bathroom the wash-basin is against one wall and as I stand at it, the shaver socket is immediately next to my right shoulder on another wall. It was allowed to be fitted anywhere in that area PROVIDING that there was no risk of it being splashed by water. It is a couple of metres away from the shower, and well away from anywhere I might reasonable splash water while using the wash-basin. I have put a small bathroom glass shelf next to the socket, and I have another shelf as a part of the lighting and mirror unit around the wash-basin. So my shaver, stubble trimmer, toothbrush chargers etc can all sit on these shelves and their power chords easily reach the shaver socket (but of course only one device can be plugged in at a time – nobody yet seems to make a multiple shaver socket in the UK). Next time you are thinking of redecorating your bathroom, you might consider getting a qualified electrician to look at moving your socket to somewhere more convenient but keeping compliance with the latest regulations. 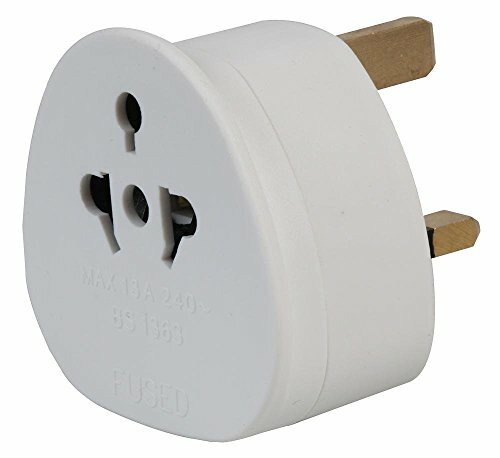 can an ordinary three pin uk plug top be connected to a two pin lead for use in uk 220volt outlet providing the item is rated at 220 volt? You can use an adapter (2 pin to 3 pin) to allow a 2 pin plug (found on electric toothbrushes) to connect to the 3 pin mains power supply. I think however you are asking if you can cut a 2 pin plug off an electric toothbrush charger and replace it with a 3 pin power adapter? I think some have done this successfully, but I would not advise on how to do it. You are perhaps best off buying this product on Amazon. I want to use an EU toothbrush in a UK shaver plug in and can‘t seem to find any adapter for it. Just the other way around. My EU plug is justs slightly wider than the UK shaver plug in. Can you help? In Germany we also have FI Protection socket adaptors when you want to use other devices in Shaver plugs, that would cut power completely upon contact of electricity and water. Faster than it could kill you. Does this not exist in the Uk? I googled, checked amazon and ebay, but can‘t seem to find anything similar. Maybe I don‘t have the right name in English? I understand your needs, but I am not aware of any adapter like this existing. Most I do believe use a 2 pin EU to 3 pin UK power adapter and charge in another room, not the bathroom. If you are in the UK for a long time, it might be worth buying a UK charging stand for your brush. I am not entirely sure what you mean by FI Protection socket adapters. Here in the UK all our electric circuits go to a main fuse/circuit board that should trip (kill the power) if there are surges in power etc. This is designed to help protect in the event of plugs and sockets being misused. I am not an electrician to be able to confidently comment on all the safety measures. Birte, in the UK the shaver sockets are connected with RCD protection ( this is equivalent to what you call FI Protection). We can also have RCD protection included on extension cables and adaptors used for power tools, garden tools etc to HOPE to shut off power in the event of an accident quickly enough to prevent electrocution of the user. NEVER rely upon it. 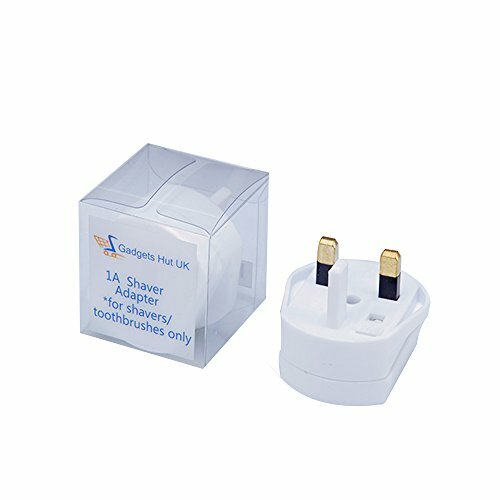 Can I plug a USA cell phone charger into a UK “shaver” socket? I believe you said that UK shaver socket is 110 volts, and that’s the same as the US. So it should be ok ? The short answer is I don’t know for sure. Not ever tried it. My general view for safety would be no. Make use of a regular travel adapter that will convert 2 pin US to 3 pin UK. This way the phone or charger is not exposed to the moisture that is often found in a bathroom. Randall – usually a UK shaver socket in a bathroom has two sockets. One is labelled 110V, the other is labelled 220V. As soon as a device is plugged into one, there is a plastic shutter that blocks off the other – only one device at a time can be connected. My bathroom socket will accept a US 2-pin (flat blade) plug. BUT, is this really the only place that you have where you can charge your phone? NEVER use your phone in the bathroom while it is plugged in. And as mentioned by Jon, FAR safer to buy a US-UK travel adaptor in a standard UK socket outside the bathroom, BUT check if your phone chagrer accepts 220-240V, I would be somewhat surprised if it was truly limited to 110V. These days all phone chargers that I have seen (and shaver , toothbrush, laptop, tablet chargers) are 110V- 240V. Is there are specific name or identifying code for the shaver/toothbrush plug? I am trying to buy an adaptor that plugs into a Japanese socket that will accept my electric toothbrush charger but all the 2 Pin sockets here seem to be the European or America types and not the 2 pin plugs the UK uses for the shaver/toothbrushes. I have not been to Japan myself to experience this first hand, but a quick search online reveals that in Japan, the Type A power adapter, is most common. This is the same as the USA as you mention. The adaptors needed are quite specific and normally you will only find the 2 pin UK bathroom adapters available in the UK, because to my knowledge this is the only place that uses this type of connection. European 2 pin plugs are slightly different. It is possible to make a setup with a UK 2 pin to 3 pin adapter and then fit that into a UK to USA plug and voltage adapter. However, for cost and hassle you are best off buying a new charging stand for your toothbrush. A charging stand with a US power cord should charge your brush fine. Here are a couple of links to places you can buy the stand you need. Hi could a shaver 2 pin bathroom socket be used via a travel plug adaptor to plug in a Sonos play 1 speaker in a bathroom? I am not aware of this being possible, I don’t think such adapters exist nor would ever be advised. There are too potential safety concerns as the Sonos in the bathroom as it has not been designed with ‘bathroom use’ in mind. Moisture could potentially get in and disrupt the electronics. I personally have a Bluetooth speaker (with built in rechargeable battery) that I use in the bathroom. Colin: I AM an electrician, and you definitely need to get a qualified electrician in to check what is happening. If this is a recent symptom and all was OK before, then you might need a new transformer/ shaver socket for the bathroom. If some thing has been newly installed, there might be a mistake in the wiring. The best way forward is to bite the bullet and get it professionally checked out. Thanks for the comment. I have not come across (to date) an adapter that will allow you to connect a 2 pin Euro plug into a 2 pin UK bathroom socket. Your best option is to get a 2 pin Euro to 3 pin plug adapter and charge it elsewhere in the home. Can you advise on an adapter for a shaver with a 12 volt/2 prong (purchased in the UK – 100-240 V) to use to charge the device in the USA? Will a regular universal adapter for many different countries be compatible with the 12 volt/2 prong? Got to be honest, not all that familiar with electrical shavers, but as I understand it, if you have a 2 prong power adapter for your shaver, that you would normally connect to the shaver socket in your bathroom, the required equipment to charge the shaver in the USA would be the same as if you were taking a toothbrush abroad. Take a look at this article on our site, I am quite sure this will help. KS: there is ONE problem that you might face, and it does not matter if you have a shaver or a toothbrush. In the UK, the 2-prong plug that usually comes with shaver and toothbrushes is NOT the same as the European 2-prong plug. The British Standard for bathrooms has prongs slightly thicker and slightly different spacing than the standard Euro-plug. Most of this style of adapter that I have found in the UK have the holes rounded enough to take UK Bathroom plug as well as the slightly smaller Euro plug. The particular model shown on ebay there is a brand that I have, and it definitely accepts the UK bathroom plug – for a shaver, electric toothbrush charger or beard trimmer. Can you explain why they ONLY make single toothbrush charging sockets and adapters? there are five in my family using electric toothbrushes….. only one bathroom! I can’t speak for all manufacturers, but I imagine the need for charging stations that can hold or charge more brushes is in reality quite limited. Families or households with multiple electric toothbrush users will share a charging stand, because the brushes don’t need to be on charge at the same time in most instances. What brand of toothbrush are your family using as there as some potential third party options that might be worth consideration by yourself. Brian: Probably like you, I have searched for a multi-output socket “uk bathroom shaver socket”, ie to allow me to charge 2 devices at once. In my case I want to leave my shaver and my toothbrush on charge simultaneously. As far as I can find, they simply do not exist. I have installed three socket-units side-by-side. As mentioned by Jon of course – you do not actually need to keep all toothbrushes and other appliances on charge 24 hours a day. I have a fender champion 50xl guitar amplifier with a 2 pin kettle lead style power cable, can I use a uk shaver adapter to plug my amp into my standard uk 3 pin wall socket. The cable is identical to one that would power a pc or tv but has a 2 pin plug on the end. I suspect this 2 pin kettle lead you have is a European power adapter, which is different to the 2 pin used on plugs for bathroom appliances. You are likely to need a 2 pin Euro to 3 pin UK plug adapter. These can be sourced fairly easily. However, given the power of the amp and the likely cost, I would suggest getting a replacement kettle lead with a 3 pin plug is a better option. Thank you for the informative article. I bought my toothbrush at Boots in the UK and it came with the 2pin plug (the sticks are closer together and slightly thicker than those on the continent). I moved to the Netherlands and cannot use the charger at all as it doesn’t fit. Can you please advise which adapter I should buy? The best is to buy a new 2 pin EU charging stand for your toothbrush. Depending on the brand, will depend on how easy this is to source. Sonicare and Oral-B ones are fairly easy to get hold of, which brand do you have? If it is a different brand, it might be more tricky. In which case. I think what you need, is something like this. It is a UK 3 pin to Euro 2 pin plug adapter, but you will see that the 2 horizontal pin inserts on the adapter are rounded towards the centre. This is to allow for the 2 pin UK bathroom plug to fit. I have linked here to Amazon UK, but you may be able to find something more local to yourself now you are in the Netherlands. Thank you so much! I looked at my various adapters (you can imagine that because of the move from the UK to the NL I already have several for the various appliances) and found one just like you recommended. So the toothbrush is happily charging right now. Thanks a lot! Strictly speaking, from an Oral-B perspective, there is no option for this at this time. So you cannot charge your current electric toothbrush from a USB port within your van. The staff in Boots are wrong too. The Genius 9000 is the model they are talking about here. It has a travel case, which has a USB port on it. However, this USB port is like a pass-through power port and does not accept the charge into the case itself. The ‘charge’ is actually gotten from a proprietary power adapter that connects to the travel case, but relies on the same 2 pin power socket as your toothbrush charger. In this instance when connected to the 2 pin shaver socket, the power cord fits to the travel case and then a USB cable can be connected to charge something like a smartphone, so the brush and a phone can be charging at the same time. Right now, aside from switching to a completely different brand of brush that can charge from the USB port in your van (Sonicare DiamondClean/DiamondClean Smart) you have no other option. Sorry I cannot offer a more positive response. Thanks for your help Jon. Hello Jon, you seem like the guy to ask about all things electric toothbrush related! So, I bought a electric toothbrush in Australia. On my return to the UK I just put a conventional Aus 2pin to UK 3pin adaptor on it and used it like that. I now appreciate that may not have been my wisest move. It’s battery life is definitely not that good anymore but it still works. I now have a bathroom with a shaver plug. Do you know of any aus 2pin to UK shaver 2pin converters? Or alternatively a UK 3pin to shaver 2pin converter? My google searches so far have been fruitless. Many thanks! To be honest, I would have done the same thing. Aside from the 2 pin AUS power connector, the UK voltage is very similar and will have likely been supported by your charging stand. Whether the battery life is worse or not as a result of this approach, I can’t say for sure, but I would be surprised. I have never come across adapters/converters that allow you to connect to a shaver socket. I believe safety has a part to play. So if your Google searches have come up with no results it is unlikely such exists. Your best bet, is to buy a UK (2 pin shaver socket) Oral-B charging stand and sit your brush on this and do away with the charging stand you got with the brush when you bought it in Australia. Great! Thanks Jon! Good idea 💡. Hi, unless I missed it you do not mention about whether it is appropriate to charge toothbrushes on sockets saying “shavers only”. I note that MK now sell a shaver socket that has a toothbrush symbol on it too. I am just refitting my bathroom and wondering whether to re-use my 18 year shaver socket which is still working perfectly (been charging toothbrush for years), or buy a new one. Any suggestions? Andy, yes, by my understanding it is perfectly fine to charge your brush from a socket that says shavers only. I have a Braun OralB Vitality electric toothbrush which I’ve had for 4 years. It states on the charger Type 3709 -220v -240v, 1W/50-60Hz. The bathroom shaver socket says 110-v – 220v & the electric toothbrush jumps two pin plug won’t stay in the two pin socket & jumps out. Most of my close by 3 pin wall sockets are 250v 13A, what would you recommend/suggest in the way of an adapter. I am loathe to get the wrong adapter as I’m unsure if the two pin plug on the toothbrush will fit the appropriate width on the 3pin adapter and I’ll be back to square one. Also if the voltage current is specified as 220-240v on the toothbrush charger, how will this affect plugging into a 250v 3 pin socket? Glad to have advice please. Did you purchase the Vitality toothbrush in the UK and are presumably using within a UK bathroom? If so, the power plug/pins should stay in the shaver socket quite happily, not heard of them coming out before. Do you use or have tried other products in the shaver socket? Could the shaver socket itself be at fault? We are not electricians, but assuming you are in the UK, the electrical circuits run at 240V so I am not sure what something mentions 250v. You should be able to buy this adapter on Amazon and use it with your normal 3 pin power supply. JOY, if your UK charger plug will not stay in the 2-pin sshaver socket, then it sounds as if one of them is faulty. My current 2-pin bathroom accessories and any that I have owned over the past 20 years have always located snugly and firmly in the bathroom socket. The UK spec bathroom plug has thicker prongs than a 2-pin euro style plug. You mention 250V 3 pin sockets nearby – I assume that they are not inside your bathroom as that would be unsafe/illegal (and as already pointed out, UK mains voltage is 240V, not 250V). Thanks Colin & Jon for your diligent responses. Be assured, the wall socket I intend to use is well outside the bathroom. However, on checking an existing UK two pin to three pin adapter I use for a different electrical item it has 250v imprinted on the outside face of the plug adapter that came with the item (ladyshaver). The bathroom shaver socket itself is quite old, 1980’s & would not be surprised if it was to be defective. The two pin socket itself appears to be in good order and on plugging in my UK purchased electric toothbrush the fit looks good & the plug appears to sit well in the socket when first plugged in, it stays in place for less than ten seconds, then first the upper pin tips outwards, followed by the lower pin. The toothbrushes cable is approx. half a metre in length and I’m able to lodge the residual cable in a high enough position to prevent it from pulling/dragging the plug out, but despite this it still jumps out. I will purchase a two pin to three pin adapter that complies with BS & hope this will charge ok. I am on holidays in Spain and have an electric toothbrush. To make it work in Spain I have to use the 2-pin shaver type plug to UK 3-pin adapter then a UK 3-pin to Spanish 2-pin adapter. I think this is crazy and of course I forgot to bring the 2-pin shaver to 3-pin UK adapter plug with me! I feel the best way forward for safety and practicality would be to change building regulations to outlaw any plug sockets in bathrooms worldwide. Nearly all electric shavers and toothbrushes can be operated cordless now anyway. In this way all electric shavers and toothbrushes for the UK market should only come with 3-pin UK plugs. You charge them somewhere else like in your bedroom and only use them without a cord in your bathroom. If you bring them abroad you only need one adapter plug. In fact I think electricity voltage, plugs and sockets should be standardized worldwide but I suppose one step at a time! Easy enough mistake to make, we’ve done it plenty of times. Take it there’s no shaver socket in the bathroom you are staying in? I forgot my adaptor in France recently but luckily there was a shaver socket tucked away. Some good suggestions there but unfortunately even if regulations were changed it would probably still take decades for the old fittings to be phased out! Sean, I do not want to have to charge my shaver, toothbrush or whatever outside my bathroom, when there is a perfectly safe, approved system to charge it inside, that does not require any special adaptor. 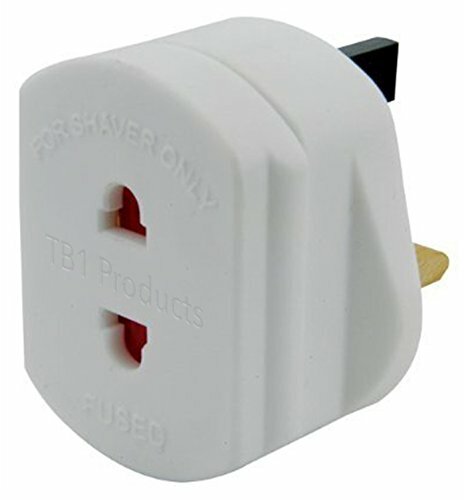 When I travel abroad, I have ONE travel adaptor which will accept my 2-pin English bathroom plug as on my toothbrush and shaver chargers, and will then plug in to either a US , Euro or Australian socket. Why should the uk change its electrical standards because you bought the wrong travel adaptor? 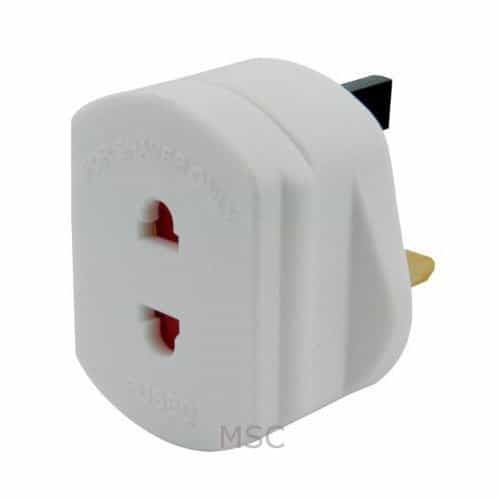 I also have a couple of adaptors bought at the airport that are not multi-adaptors, they are white plastic and accept a UK 3-pin plug on one side and have either a Euro 2-pin plug or a US 2-pin plug on the other side. 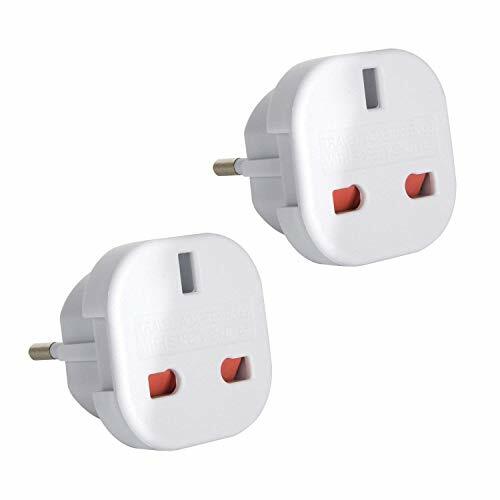 The UK 3 pin socket has slightly rounded holes for the live and neutral – and these allow it to accept the UK 2-pin bathroom plug, or the standard 3-pin plug. I never use more than one adaptor to connect my shaver or toothbrush chargers to a socket in Europe or US. Hi, have recently bought a Waterpik flosser which is supposed to plug into the shaver socket, but it just doesn’t work, although we trickle charge our electric toothbrushes fine all the time and no-one else seems to have a problem. Wonder if this means the transformer inside the socket is on the fritz? Using it with an extension cable plugged into a 3 pin socket in the bedroom with an adaptor plug for now but not good for long term use and I don’t fancy using it over the kitchen sink!! It seems a little odd that the Waterpik works fine when running from a 3 pin plug/extension lead but not from the socket in the bathroom, that your toothbrushes charge from. I can only think either there is limited power going to the socket in the bathroom or there is a potential fault with the unit, but the latter seems unlikely. Presumably the toothbrushes always charge fine? Does the Waterpik power adapter fit comfortably into the socket in the bathroom?! Perhaps reach out to Waterpik and see if they have any other suggestions. I am sorry I cannot be much more help, would love to know the outcome. Hi Jon. Thanks for this article. We live in Austria. Is it safe to plug our British toothbrush charger into a regular UK-Europe plug adapter and into the bathroom mains power supply? It seems to work when I’ve tested it. Thanks very much. Hi Jez. Yes this is fine. The voltages are the same, just the plug that is different, hence the adapter. Thanks very much! Toothbrush happily charging away. I bought a two pin socket for my electric toothbrush charger but the toothbrush charger doesn’t fit in to the socket properly. It will go in all the way if I push but won’t stay there – it pops out. When it’s pushed in, it is charging the toothbrush but it obviously won’t work for me to hold it in place for the whole charging cycle. Perhaps your one is faulty? Have you spoken to the seller that you bought it from? We are seeing a similar issue. Having just bought new Braun electric toothbrushes, the pins on the charging lead are a smaller diameter than in the past (same spacing though), so they are not gripped properly by all sockets or adaptors. Jon Love says: ” In the UK the mains electricity that you connect your appliances and gadgets into works on 240 volts. This is a high current and can cause serious injury and death if you were to touch a live electrical line.” – Jon, 240V is not a high current it is a voltage. For a given device, it will require/draw a higher CURRENT if operating at 110V than if it is operating on 240V (Power= current x volts) That is one reason the UK uses 240V and sees it as safer than the US 110V. 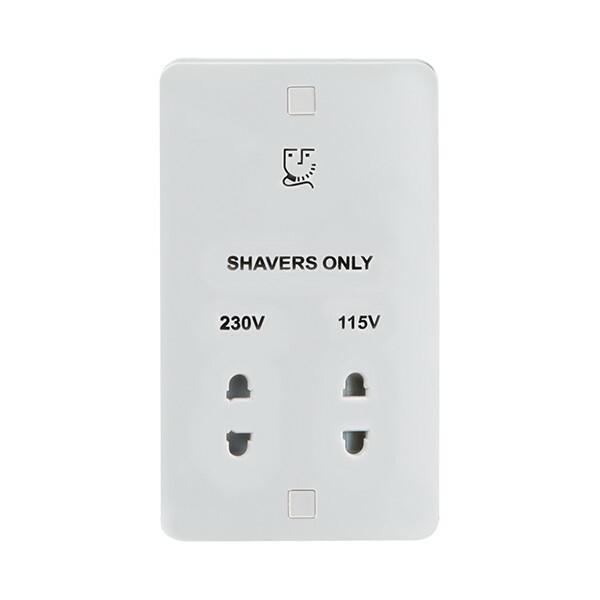 UK bathroom “shaver sockets” are designed to meet BS-4573, and have an special transformer inside to isolate the device from direct connection to the mains. They also have a current limit – suitable for say a shaver or toothbrush, but not a powerful hair-dryer. This is part of the reson that the sockets are designed NOT to take the European 2-pin plug, to prevent high-power domestic devices being plugged in. my charger will never go anywhere near a bathroom, i charge up my tootbrush in my bedroom. the adapter is a pain in the yaris;. cant i just cut the 2 pin off and attach a standard 3 pin uk plug? Dont bleat on with health n safety stuff. all i wanna know is,, will a 3 pin work ok.
Andy, I wish not to advise. Whilst it may well be possible, I don’t have the knowledge in electronics to say for sure. You might not be worried about the health and safety, but I wish not to advise on something that could be dangerous. Right.. ive put a 3 pin standard plug on the end of this cable.. 3a fuze. Its next to me in the bedroom . Its charged up all 3 of our brushes. Luckily a tsunami hasnt hit us and got into the electrics. Thanks Jon. I appreciate (thinking about it) that having a long cable dangling around in the bathroom isn’t a very safe idea. However, if they had a version of the cable that had a 3-pin plug on the end, along with a longer cable, then there wouldn’t be the safety issue because it couldn’t be used in the bathroom. Talking of safety issues I tried a bit of DIY. I cut the plug off the end of the cable, fitted an IEC socket and plugged a kettle lead into that. Big flash (guess there’s step-down type components in the plug that hadn’t occurred to me). Fortunately my razor wasn’t connected but still going to need a new cable and Clean and Charge I think, although not sure that the Clean and Charge would be much use to me. Shame. Thanks for your help, sorry for ignoring it. (I’m not going to get an electrician to fit a new socket in my bathroom, for one thing I don’t think there’s anywhere sensible for it in my bathroom). Thanks. Hi Jon. Thanks for the article. I got a Braun Series 9 shaver recently and the coiled cable is really short! As it connects to the cleaning station then I’m looking for a longer cable and don’t want it to drag the cleaning fluid off the shelf I’m putting it on. I was looking for a 2-pin extension cable. Do you know if such things exist? Thanks very much, Tony. I am not aware of such a product and a quick bit of research does not really show any matching results. There are many comments/articles that raise some safety concerns. I would suggest consulting an electrician. Judy, if you are in the UK and using a toothbrush designed for the UK (voltage on the base of the charger should show support for 240v), then connect your toothbrush to the 240v outlet, not the 100v. I have a 2 pin Uk plug on my toothbrush charger but moving to bermuda so need a 2 pin USA adapter to plug it in can’t seem to find one ? You want a product like this one. You see how in the 2 lower pin slots, they are rounded at the edge. This should allow you to fit your 2 pin toothbrush cable into. However, you also need to consider voltages. On the bottom of the toothbrush charging stand it should say what voltage it supports. If 100-240v, you need just the plug adapter. If it says something like 220-240V you will need to buy a voltage adapter/converter. Hi. Is there any reason why one shouldn’t chop off the three pin plug and fit a standard three pin 13 amp plug, fitting a 1 amp fuse probably? Richard. I am not an electrician or qualified to say. Probably best speaking to someone who can advise particularly surrounding the safety. No doubt it is possible, but how best to do it, I am am not sure. Hi Bob. If this is the case, why is it that charging stands are specifically rated for certain voltages? All charging stands that I have ever seen – for toothbrush, beard trimmer, shavers, have been rated for 100 – 240V. I had not posted a picture of your socket Lesley, as you sent this to me by email. However, for reference, it is included below. We concluded that the plug is connected to the central pin and either one of the outer pins. Hi, I’ve just bought an electric toothbrush with a two pin battery charger but when I went to fit it to my two pin socket in the bathroom it is too small. Not a problem as I can just get an adapter but am I right in thinking that two pin sockets are not all the same ? What country do you live in and where did you buy the toothbrush from? 2 pin plugs are common across Europe and are the ‘standard’ but in the UK there are 2 pin sockets found in the bathroom only, but the size and spacing of the pins are different, so depending on your location and where the brush was originally intended for sale have a bearing. For example, if the brush was sold in the UK and you are using it in Spain, the plug on the charger will require an adapter to be used with the Spanish sockets. Hi Jon! I live in the UK and purchased the toothbrush here also. Yes the bathroom socket’s holes are spaced too widely apart for the toothbrushe’s 2 pin plug. I bought the Phillips brush from Amazon, (received in a couple of days) and there was no indication that it was a European version. This is odd. If sold and dispatched by Amazon it should in theory be a UK compliant plug and fit nicely into the 2 pin shaver/power socket in the bathroom. Obviously you should not force the connection but have you actually tried pushing the plug into the socket or has it just been your observation so far. Do you have any other 2 pin socket products, perhaps a shaver to compare too? Failing that maybe picking up a 2 pin to 3 pin adapter. Hi Jon, the shaver socket has 3 holes, one central square hole and 2 on either side that are rounded. it says 115v above the left round hole and 230v above the right. Perhaps I’m supposed to use one or the other with the central hole? I’m sorry, I sound like an idiot! I am not familiar with such a plug layout, not come across this before. I am familiar with the look as per this image. What you are saying does sound plausible. You might want to consult an electrician to be sure. 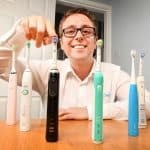 Thank you for a very well written article about rechargeable electric toothbrushes. I live in France and I have just purchased a new electric toothbrush. If I understand your article correctly, I can not use our regular outlets that we have here in France. I thought I would be OK because we use what I thought was the same 2 pin plug on most of our appliances. Do I need a 2 pin to 2 pin adapter? And if so, is there such a thing? I look forward to hearing from you. Connie. If you bought the toothbrush in France it is fine to use with your normal power sockets. In the UK our toothbrushes come with a 2 pin plug but this is not the same as sockets found in France and other countries of Europe. A toothbrush bought in the UK will require an adapter to be used with the 2 pin socket in France. I hope tiki clears things up. A travel adapter like this on Amazon should do the trick. You might be able to pick something up locally from a good hardware store. Thanks, this article was really useful? I live in the UK and bought a US toothbrush to plug in the 110v socket so we can have 2 brushes on charge at the same time. Only thing is I can’t find an adapter to adapt US 2 pin to UK 2 pin socket… Does such a thing exist please? Hi Mark, Not sure such a thing does…. I have a US charger, but I have purchased this voltage converter to enable me to charge the brush in the UK. But this is connecting to 3 pin UK rather than the 2 pin UK bathroom socket. Mark, you cannot plug both a 110V and 240V device into the standard UK bathroom socket. The holes are shutterred so that you can only plug EITHER a 240V or a 110V device in, not both simultaneously. Hi Jon, what was your reply to Terrence re leaving the charger plugged in continuously with the toothbrush on the charger except of course when brushing. There does not seem to be a reply so far. Thanks for following up on this. From a performance point of view it should be fine and it is something we have done ourselves in the past. Typically with battery health though it is better to let the battery discharge somewhat before charging again, and occasionally letting it discharge completely. From an energy saving point of view it is of course better not to have a constant charge running.